I don’t usually watch American sitcoms as the humour doesn’t normally work for me and I find them more “stupid” than funny, but Brooklyn Nine-Nine is the exception that proves the rule. Brooklyn Nine-Nine is my new favourite show and it’s near enough the definition of my un-problematic fave. It has a diverse cast and their ethnicities, genders and sexualities and are never used as the punchlines of any jokes – do you know how refreshing that is?! All the characters are well-rounded and they have their own story arcs throughout the series’. While Jake Perelta (Andy Sandberg) may be considered the lead, he’s not your Typical Straight White Male lead – he’s feminist, loyal, understanding and once punch a homophobe in the face. Then there’s the other characters. Terry Jeffords (Terry Crewes) is super strong and super caring, Amy Santiago (Melissa Fumero) is incredibly competitive, Rosa Diaz (Stephanie Beatriz) is slightly terrifying and is very much a badass while Charles Boyle (Joe Lo Truglio) is Jake’s best friend and loves weird food. And I can’t not mention too of the best characters Captain Ray Holt (Andre Braugher) Captain of the Nine-Nine and has the driest sense of humour, it’s amazing, and Gina Linetti (Chelsea Peretti) has the most self-confidence of any character I have ever seen. I love them all in different ways and for different reasons. Everyone is so great and funny and it’s great to see how their relationships grow and develop over the course of the seasons. They are all so different but they still make this weird family that always cares for each other. The humour in Brooklyn Nine-Nine is so broad that sometimes I smile but more often than not I full on belly laugh. I love how quick it is, how there’s no pause for the laugh track so the dialogue comes thick and fast and it feels very natural. It’s just such a fun and funny and light-hearted show that can still hit you in the feels and I love it so much. OK so I’m impatiently waiting for season three of Brooklyn Nine-Nine to arrive on Netflix after I binged watched the entirety of the first and second season in a matter of weeks. Brooklyn Nine-Nine is now one of my favourite shows and it has even become like a “comfort show” – if I feel a bit down I watch a couple of random episodes and I’m soon smiling and feeling better about life. So why do I love Brooklyn Nine-Nine so much? There’s a lot of reasons. First there’s the humour. 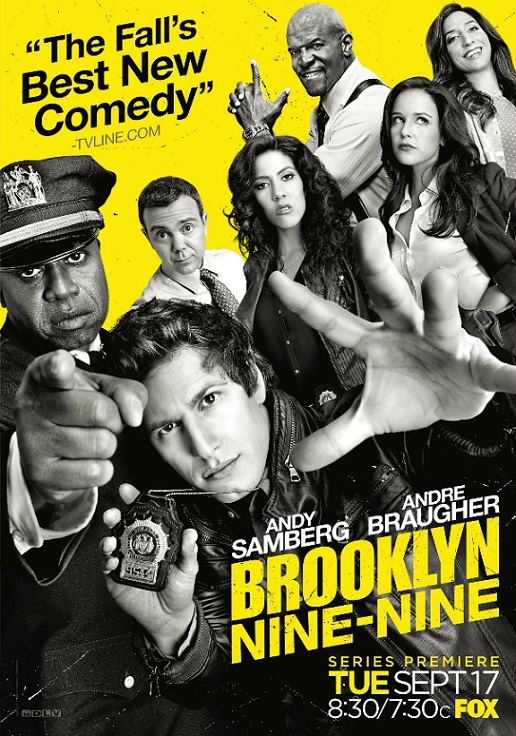 Brooklyn Nine-Nine is funny, it may not always be laugh out loud funny but it’s very quick-witted and has some smart humour. I wasn’t sure what I’d make of Brooklyn Nine-Nine when I first started to watch it, American humour isn’t always my cup of tea but I love how smart and quick the humour is. With the humour comes the opportunity to not make cheap, possibly offensive, jokes. Brooklyn Nine-Nine is so great because it calls out all the sexist, racist, homophobic humour you might get in other shows and in real life. Jake could easily be the arrogant womaniser but he really does care about his female friends and never belittles them, and he calls out other peoples’ bad behaviour. This gifset shows how Brooklyn Nine-Nine calls out multiple characters and situations and it’s wonderful. Then there’s the stories. While each episode is kind of like a crime-of-the-week type deal and they are all pretty fun and even exciting, there’s the overriding story-arcs and relationships. Characters date different people and then break-up or there’s stuff like Terry’s family or Jake and his dad. It’s small stuff that develops over the episodes and you can see how these characters grow or what’s happened in their past to make them into who they are. And that’s the main reason I love Brooklyn Nine-Nine so much – the characters. 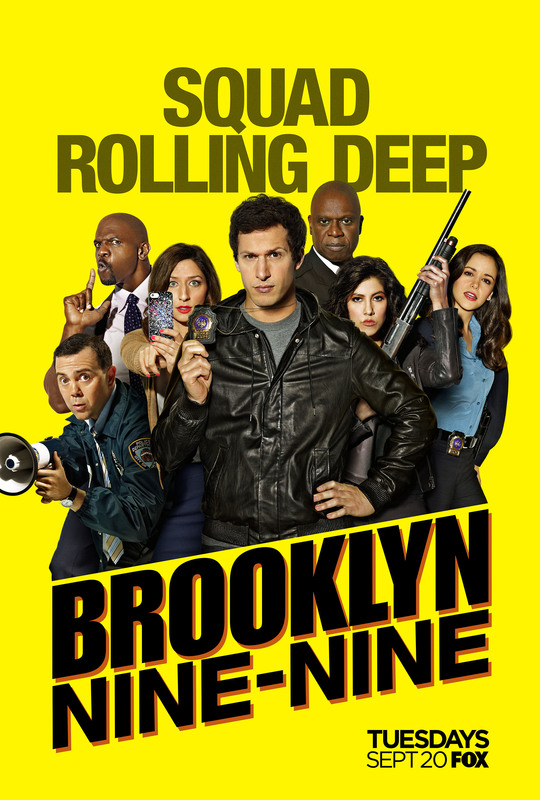 Jake is a great detective but is also a big kid, Amy is competitive and competent, Boyle loves food and loves his job, Rosa is a total badass, Terry loves his kids – both his twin daughters and the detectives under his charge, Captain Holt is serious and hard-working but he can still have fun with his team and then there’s Gina, Holt’s assistant when she isn’t attached to her mobile phone. Oh and I can’t forget Scully and Hitchcock, they’re the older detectives and many people think they’re kind of useless but that’s not always the case. I love all of the characters and together they become a family, which is my favourite trope in fiction. Found families, that are a little dysfunctional and sometimes a little broken but they all care about each other are the best thing in my mind. The detectives of the Nine-Nine are all friends who trust and care about each other and it’s so nice to see a show where there’s no real conflict between the main characters. In short, I love Brooklyn Nine-Nine so much because it’s fun, smart and I love the characters and their relationships. I cannot wait to see season three and see how this brilliant show continues to be amazing. I’ve only recently started watching Brooklyn Nine-Nine and I’ve already got a series case of “I LOVE EVERYONE IN THIS BAR!” with these characters but Terry was the first one I fell in love with. Terry Jeffords is a big strong guy who also cares about his wife and two young daughters a ridiculous amount. When his twin daughters were born he got so scared about getting hurt on the job and leaving them without a father that he had a desk job for a year. But by doing that he let down his grownup kids, aka the detectives in his precinct. So with the help of the Captain and Gina (the Captain’s assistant and the kind of person who knows everything) he got his gun back and returned to the field. Terry is so great because he is a man of many layers. Yes he can easily pick up his co-workers but he also has a minivan and likes to paint and dance. He works out but can’t sleep without whale sounds and a princess fairy castle defeats him. Terry is so great because he looks like this big scary dude but he really is a big softy that cares a lot about his family – both his wife and kids, and his family he has in work. Terry is also pretty hilarious, especially when he’s trying to look out for his detectives. He is willing to stand up for them but he will put them in their place if they haven’t been pulling their weight or they are making poor judgments. Terry would be the best kind of boss, like he’s a fun boss but you’d be able to tell when you’re close to crossing the line and stop before he gets mad and breaks things. I’m notoriously bad at keeping up with TV shows. I think a part of it is that at University I don’t have a TV so must remember to find a streaming/download link for the show each week. This is especially a problem when it’s a TV Show that’s not currently on UK TV on BBC, ITV or Channel 4 because at least those have catch-up websites. Plus, it’s a lot of time to commit to a show, especially if it’s on season 6 and each season has twenty-odd episodes – I’m not sure if I’m ready for that sort of commitment. So here are some TV shows that I’d love to try but I’m not sure if/when I’ll get around to it. If there’s any show that I’m probably going to try in the relatively near future, it’s this one. American humour can sometimes be a bit hit or miss for a Brit like me but from the excerpts I’ve seen it looks good and it’s got a diverse mix of characters.